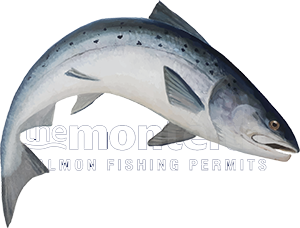 Have you ever truly thought about all the different components that create a really good salmon fishing pool and why salmon will congregate there in numbers. The following paragraphs will give an insight into how a professional salmon guide's mind works on this topic and hopefully will unlock a few different trains of thought on this fascinating subject. The basic components that create a good salmon holding pool undoubtedly come down to depth and flow rate. When a salmon enters the fresh water rivers it loses the security the vastness of the ocean provides and has to run up through various shallow streams where it's vulnerable to all forms of predation. Therefore when a salmon reaches a deep water pool where it can become more or less invisible again it is highly likely to hold in that area before it senses the right time to move again. Any deep water pool that has a steady slow flow that brings oxygenated water through its mouth and out of its gills is going to allow the salmon to preserve its energy levels until these precious reserves are needed once more when the next opportunity to run appears. Add into the 2 above components a fast water pool neck and a classic V shaped pool tail with a few different sub surface riverbed features and some depth for security and you have a great starting blend of features that salmon just love to be around. Salmon can hold for a long time in a pool where disturbance levels are not too high and a well run salmon beat will keep the rod pressure limited so as not to move salmon on or switch them off completely from taking a fly. The less salmon see of a fly or lure the more likely chance there is of a fish taking but many anglers don't fully understand this as often you'll see pools stuffed with fish that won't look at anything and that is often a sure sign of over-fishing. Another fact I've discovered over the decades of being professionally involved in this business is that when a salmon is caught and released the fish will not immediately resume its upstream journey but will sit in that pool for days, weeks or sometimes months before eventually moving on. On the River Tay catching an early Spring salmon (even in high water) and releasing it was a certain way of setting up a 'live decoy' in the pool which would naturally attract other running fish to stop. The more salmon that are caught and released the more a pool will fill up with other salmon too until such times as a high water flood moves them on. What I've just mentioned has been carefully assessed through decades of observing salmon behaviour and I've seen this work on many occasions over the decades. There's much more to salmon behaviour than most people realise and that's why it's important to consult with only those who have spent enough time observing salmon behavioural traits through professional career based riverbank experience which should make good sense.